It is no easy feat to fit three children in the backseat! Often, parents of triplets (or three children of multi-age) worry about how they will safely fit all of their children in a small car. Rather than spending tens of thousands of dollars on a new vehicle, a better (and far less expensive) option is to look into purchasing a set of narrow high back booster seats. That way, all three of your little ones can sit together comfortably and safely in the small car that you already own! What is a narrow highback booster? Is there a narrow booster seat that will fit three across? How do I know if my child is ready for a narrow 5 point harness booster? A narrow highback booster seat is a child safety seat that helps position your older child in a car. Seating in a typical car is designed for an adult. For a child to safely sit in such seats, they need to be positioned correctly, even when they have outgrown a typical car seat. For this reason, high back boosters are used for positioning. Of course! All of the boosters listed here should fit three across in most cars. All of these slimline high back booster seats measure 20” across or less. If your child is over two years old and over 22 lbs they can sit in one of these narrow highback boosters. Younger and smaller children should not be in a booster just yet. 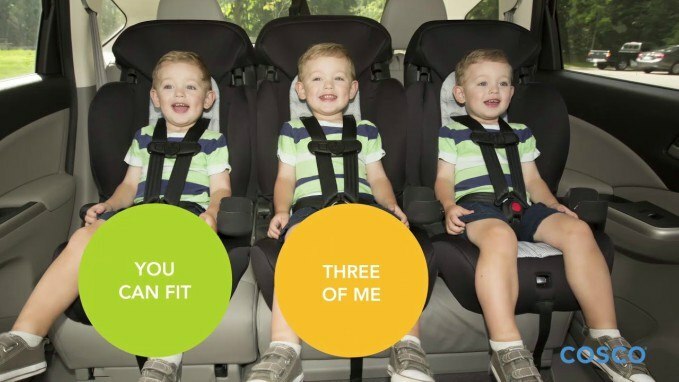 If your child is between ages 2 and 5, they likely need to use the 5 point harness feature. After that, the booster can be used as a seat belt positioner until the weight or height limit is hit! We have looked at all of the options available and selected the best narrow booster seats (and they all have 5 point harnesses!). Check out our comprehensive reviews below. Graco is well known to be a top leader in car seat safety. If you are looking for a well-padded, safety tested seat for your kids, this high back booster is a solid choice. ​The Atlas is easy to install and should fit three across in most cars. It has a steel-reinforced frame to provide maximum protection for your child, which makes it a little heavier than the average seat. One nice thing about this seat is how easy it is to clean. You can wash the cover and replace it without any fuss or trouble threading the straps, which saves you time! Since you don’t have to re-thread this seat, there is less room for user error, making this seat extra safe. This Graco Atlas is our top pick for narrow highback booster seats when you need to fit three across! This seat was specifically designed by Cosco to fit three across in most cars, making it nearly guaranteed to work well for your family. 5-point safety harness up to 65 pounds. The Finale is a lightweight high back booster designed to work for your child for many years. It can easily be moved from car to car (no need to buy an extra seat for your second car or babysitter), and it has special fabric to make the ride more cozy for your kids. As a bonus, this seat comes in four cute colors for your children to choose from! This high back booster should last you for many years, and the one year warranty has got you covered for any manufacturing defects. Amazon and Target offer free shipping on this seat, and free returns just in case it doesn’t work out! Looking for something a little different to get your fussy kid to enjoy a car ride? This Disney high back booster chair is made just for you. Disney characters and superheros designed that kids want to stay in! Harness system features Energy Absorbing Technology. You probably haven’t seen a seat quite like this before! Designed to entice your child into enjoying their seat, it comes in a variety of disney characters and superheros. Don’t let the fun design fool you though. This high back booster is safety tested, likely to fit three across in your car, and well made to last for years. You can score this seat on Amazon for a decent price, even though it is more expensive than the others on our list. Don’t forget, they offer free shipping and returns! This Cosco seat has been a top contender on the market for several years. Now that there is a newer model (reviewed above), you can find the 2-in-1 at a deep discount. If you are looking for a narrow high back booster that won’t cost you much even when you need to buy three, this might be a good choice for you. LATCH equipped and features a 5-point harness that can be adjusted from the front. This 2-in-1 will easily fit three across in practically any car. At under 19” wide, it is the narrowest seat on our list. If you have a compact car, the Cosco might be your best bet. It will also fit well in an airplane, if you often travel. Not only will this work well with your growing child, but the entire cover can be thrown in the washing machine, making it easy to clean as well. If you look around, you can find this seat for under $55 in certain colors, and Amazon offers free shipping and a one year warranty. This Evenflo seat has a lovely design and is made by a company well known for its rigorous safety testing. Meets or exceeds all applicable federal safety standards and Evenflo’s side impact standards. The Maestro is a rare find! Both affordable and slim, it should fit three across in nearly any backseat. This seat is also unique in that it fits children up to 110 lbs, giving it the biggest weight range on our list. You will literally get years of use out of this seat, and likely never have to buy another car seat again! The Maestro comes with a warranty to cover any defects, and you can score a good deal at both Target and Amazon, with free shipping from both sites! If you need a narrow high back booster seat with 5 point harness, you can’t go wrong with any of the seats on the list! Overall, both the budget seats and the more expensive seats will get the job done. It just depends on what features your family needs. If you are looking for the best narrow high back booster seat with 5 point harness, any of these seats would be an excellent, safe, and comfortable choice!